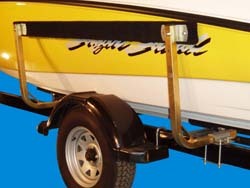 Boat Trailer Guides | Boat Trailer Bunk Guide-Ons | VE-VE Inc. NOTE: These Bunk Guide-Ons are QUALITY AMERICAN MADE Products, and you DO get what you pay for! Boat Trailer Bunk Guide-Ons, T-916; 16" Vertical Carpeted Bunks model, 1 PAIR (1 ea. shown). 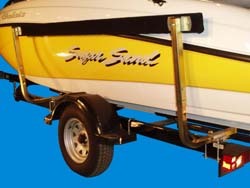 Boat Trailer Bunk Guide-Ons, T-918; 18" Carpeted Bunks, Single Post model, 1 PAIR (1ea. shown). 1) Welded steel brace at tube form for added strength. Boat Trailer Bunk Guide-Ons, T-924; 2' Carpeted Bunks model, 1 PAIR ( 1 ea. shown ). Boat Trailer Bunk Guide-Ons, T-948; 4' Carpeted Bunks model, 1 PAIR ( 1 ea. shown ). Boat Trailer Bunk Guide-Ons, 5-1/2' Carpeted Bunks model, 1 PAIR (1 ea. shown). SIMPLY PUT, THE BEST MADE!!! Boat Trailer Bunk Guide-Ons, 7-1/2' Carpeted Bunks model, 1 PAIR (1 ea. shown). SAME as T-976; 1 pair (1ea. shown) But LESS WOOD, (DOES COME WITH CARPET for 2 ea. 8' long 2" x 4" boards). By doing this you SAVE $60.00 !! Telescoping tube for Bunk hieght adjustment. The T-957; "Bunk Spacer Brackets" ( Set of 4 ea. ) 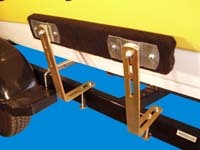 are used with the T-924 (2'), T-948 (4'), T-956 (5-1/2') or the T-976 (7-1/2') Bunk Guide-Ons, when more inward adjustment is needed.